With all the weaponry, long, hard treks and recurring confrontations with wild animals that come with the sport of hunting, it might surprise you to know that deer and tree stands are actually behind many hunting-related injuries. This is partially due to the ubiquitous behavior of hunting while perched atop a high lookout or on the side of a tall tree … especially when it comes to bagging deer and elk. In this era of modern hunting, you can’t really get around using a deer or tree stand if you want any shot at anything good. 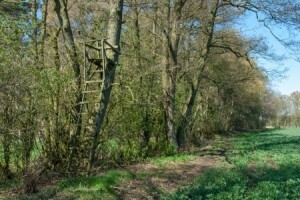 This reality means that thousands of hunters each and every year scramble up very tall ladders and/or trees with loaded weapons and a head full of adrenaline. This, unfortunately, is a recipe for disaster. You would be hard-pressed to find a single hunter or outdoorsman that hasn’t known (or at least heard of) a hunter that had been injured or worse after falling out of deer or tree stand. The sad fact of the matter is that it happens all of the time (quick Google News search will bring you loads of results just like these). This sort of information is not intended to scare hunters; it’s simply meant to remind hunters that their sport can be a dangerous one and that safety measures can and should be taken. By following some basic precautions, it’s actually incredibly easy to stay safe while hunting from a deer or tree stand. Learn all about it here.